The wicks of the coil transport the e-liquid by capillary action from the reservoir to the resistance wire. Pressure on the battery's power switch causes the coil to heat to between 50°C and 70°C which in turn leads to the vaporisation of the small amount of liquid in contact with it. The produced vapour rises in the chimney to the mouthpiece placed in your mouth. A mouthpiece or drip tip that is in contact with your mouth. Its form and texture will play a role in how pleasant it is to vape and the temperature of the vapour inhaled. A leak-proof compartment often transparent and with a gauge designed to receive between 1 and 6 ml of liquid. Upper part of the atomiser to which the drip tip is clipped on. Composed of a wick made of glass fibre or silica encircled by a resistance wire. This is the consumable part of the clearomiser that you have to change regularly. A base that lets you attach the clearomiser to the battery and which, in more recent models, includes an airflow control ring. 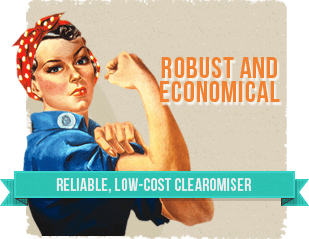 You want a reliable clearomiser (that doesn't leak) and that won't cost a fortune. 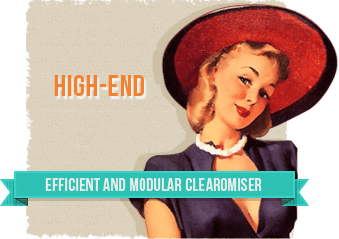 You want a clearomiser with that gives you flavours and an exceptional vaping comfort. You want a clearomiser capable of reproducing a huge amount of vapour so as not to go unnoticed. a mouthpiece or drip tip that is in contact with your mouth. Its form and texture will play a role in how pleasant it is to vape and the temperature of the vapour inhaled. a reservoir: a leak-proof compartment that is often transparent and with a gauge designed to receive between 1 and 6 ml of liquid. It can contain between 1 and 6 ml. a coil composed of a wick of glass fibre or silica encircled by a resistance wire. This is the consumable part of the clearomiser that you have to change regularly. a chimney: a central tube in which the vapour rises up to your mouth upon inhalation. a base that lets you attach the clearomiser to the battery and which, in more recent models, includes an airflow control ring. How does a clearomiser work? The wicks are soaked with the liquid of the reservoir and ensure that the liquid is fed to the resistance wire by means of capillary action. Pressing the battery activation button heats the coil to between 50 and 70°. This causes the small amount of e-liquid in contact with the coil to vaporise. The vapour produced rises in the chimney to the mouthpiece placed in your mouth. How to choose your clearomiser? 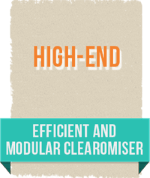 The quality of steam is closely linked to the vaporisation device that equips the clearomiser. This vaporisation device, also known as the coil, is made of a resistance wire spirally twisted around a wick (fiberglass, ceramic fibre, organic cotton...). Its assembly, which varies according to the model, will influence the amount of vapour depending on the surface area of heating and the amount of liquid in contact with this surface. Likewise, the value of the resistance (or impedance) in ohms will play a determining role on the heating temperature and the amount of vapour. To a lesser extent, the position of the coil in relation to the mouthpiece may influence the vapour temperature. In other words, depending on the type of coil and the impedance value chosen (in ohms), you may not get the same results even when the electrical power used for the heating is the same. The Hit: this is the sensation felt by the smoker at the moment of inhalation of vapour, which can be described as a contraction of the larynx as the vapour passes over it and a tickling sensation at the back of the throat. 2 manufacturers stand out with the quality of their products and constant innovations: ASPIRE and KANGERTECH. BDCs (Bottom dual coils) produce a great amount of dense vapour with a tight draw. This dual coil system makes it possible to increase the heating surface and thereby release a lot of vapour. However, the e-liquid consumption is higher. BDCs are ideal for e-liquids with large amounts of propylene glycol (>70%). BVCs (Bottom vertical coils) produce a satisfactory amount of vapour and provide an excellent restitution of flavours with a lighter draw. This type of resistance is recommended with the use of e-liquids with large amounts of vegetable glycerin (> 50%). BDC to produce a great amount of dense vapour. This dual coil system makes it possible to increase the heating surface and thereby the quantity of vapour. However, the e-liquid consumption is higher. BDCs are ideal for e-liquids with large amounts of propylene glycol (>60%). BVCs (Bottom vertical coils) produce a satisfactory amount of vapour and an excellent restitution of flavours. This type of coil accepts all types of e-liquids, from the highly viscous (100% VG) to the very fluid (100% PG). Clearomisers equipped or compatible with: Aspire nautilus, Aspire mini nautilus. Aerotank V2 produces a large amount of hot/warm and dense vapour. A dual coil system makes it possible to increase the heating surface, and makes it possible to vaporise more e-liquid at a time. Therefore, it generates a lot of vapour. These coils work well with of all kinds e-liquids, from viscous to very fluid ones. Protank produces a satisfactory cold/warm vapour and gives an excellent restitution of flavours. A single coil system that will suit users who prefer the restitution of flavour rather than a large vapour production. This type of resistance is recommended for the consumption of e-liquids with fruity flavours, rich in propylene glycol (>70%). Clearomisers equipped or compatible with: EVOD 2, mini protank 3, aerotank V2, mini aerotank, mega aerotank, mow aerotank, mega mow aerotank, peakomizer. These coils are generally located on the upper part of the reservoir. Silica fibre wicks capture the liquid contained in the reservoir by capillary action. Because of the position of the coil near the mouthpiece, the generated vapour is hot. These coils tolerate very fluid e-liquids that are rich in propylene glycol (e.g., 80 PG / 20 VG). They are especially popular with tobacco flavours. Clearomisers equipped or compatible with: T2 by Kangertech, Stardust V3 by VISION and iClear 30 S by Innokin. These are coils with very low values of impedance (typically between 0.5 and 1 ohm). The clearomisers equipped with such coils are used at high power (between 15 and 30 W). The vaporisation system is adapted to allow a significant input of e-liquid and avoid a burnt taste. The Sub ohm coils generate a lot of vapour. Clearomisers equipped or compatible with: Atlantis by Aspire and Subtank, mini subtank, nano subtank by Kangertech. Use with adequate equipment. See the list of MODs and compatible batteries in "What is Sub Ohm?". How to choose the resistance value? The resistance value, measured in ohms, is an important point to consider. The lower the resistance value, the more heat is produced, which increases the hit (sensation of vapour passing down the throat), the amount and temperature of the vapour. Your battery will discharge more quickly. You produce more vapour but consume more e-liquid. Your coil will clog up and wear out more rapidly. So be careful not to chose resistance values that are too low (see the summary table below) at the risk of getting a burnt taste due to a too rapid vaporisation of e-liquid. Note that constant voltage batteries such as Evod and eGo have an output voltage of 3.7 volts. Therefore you should choose resistance values between 1.5 and 2.2 ohms. If you have a variable voltage battery such as in the Spinner, Aro or Aspire battery range, the resistance value is less important. You can, in such cases, adjust the power of your electronic cigarette by varying the voltage. If the resistance is too low, you can reduce the voltage. And if the value is too high, you can increase the voltage. To put it simply: the lower your resistance in ohms and the higher the voltage, the more power is delivered. It should be noted that specialists have recognised a power of between 8W and 12W as optimal. The sweet spot can be understood as the right temperature for your e-liquid to reach in order to give the best of itself and to produce the maximum sensation (amount of vapour and flavour restitution). This result is directly influenced by the coil temperature. In other words, the sweet spot is when you find the right power (calculated in watts) to heat a liquid. It will depend on the liquid itself and of the ratio between the battery voltage (in volts) and the resistance of the atomiser (ohms). A power between 8 and 12 watts is ideal according to experts. 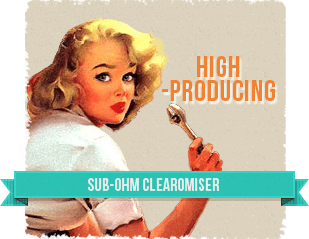 Sub-ohm clearomisers are clearomisers with a very low resistance, less than 1 ohm. They use a high power (15 to 30 W). Therefore they generate a lot of vapour and a very big hit, even without nicotine. The vaporisation system is adapted to allow a significant liquid inlet in order to continuously supply the fibre, located at the resistance wire, and thus prevent a burnt taste. It is advisable, with this type of clearomiser, to use liquids rich in vegetable glycerin (>60%) and with lower nicotine levels than what is conventionally used. Please note: The heating temperature of the coil is much higher than for standard clearomisers, and your consumption of liquid is increased tenfold. 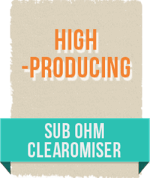 Warning: Sub-ohm clearomisers should be used with appropriate equipment, supporting a continuous discharge current of 8.5 amps. We recommend their use with mechanical mods, coupled to suitable batteries, that can support more than 8.5 amps or with electronic mods accepting resistances of 0.4/0.5 ohms. Does the clearomiser suit your battery? Generally, all atomisers are mechanically compatible with your battery. They connect to it either through the external male-end eGo/510 screw thread of the battery or by the internal female-end 510 screw thread. In some cases, you may have a 510 screw thread on your battery and an eGo screw thread on your atomiser: in that case, you will need a 510 to 510 + eGo adapter. You may also have a case of an eGo-type screw thread on your battery and a 510 screw thread on your clearomiser. In such cases, threaded beauty rings will improve the aesthetics. What is the life-span of a clearomiser? The way that you vape: the frequency of use, the length of inhalations, the battery voltage and the resistance value used. In the same way, the type of liquid used will also play a role in the life-span of the coils. The use of coloured and viscous liquids rich in sugar and vegetable glycerin leads to a more regular refilling. It is therefore more appropriate to talk of life-span in terms of amount of e-liquid used rather than in terms of time. 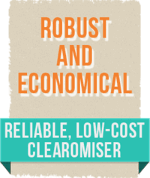 For a classic use of e-liquid (80/20 PG/VG), the life-span of a clearomiser will be between 20 ml and 30 ml. How do you maintain your clearomiser? In order to increase the life-span of your clearomiser, you should disassemble it, and rinse the reservoir and the coil with hot water once a week. Make sure to dry it well with absorbent paper before re-use. Avoid at all cost putting e-liquid on a wet wick. You can also use white vinegar. After rinsing the different parts of your clearomiser in hot water, leave your coil to soak in white vinegar for 12 hours. Rinse thoroughly again with hot water and let it dry on absorbent paper. This method, known as "dry burning", consists of burning off deposited residues that hinder the atomiser from working properly. When should you change your coil? When heated, the coil turns the liquid into vapour. But in time, a deposit is formed and the coil becomes dirty. Result: the coil heats less, produces less vapour, and the deposit mixes with the liquid due to the effect of the heat. A decrease of vapour, a poor restitution of flavours and a darkening of your fluid are the warning signs of tired coils. You just need to buy new coils, sold separately or in packs. To find the right coil, check the clearomiser accessories that you bought. How do you fill a clearomiser? Prime the clearomiser during the first filling or after changing a coil: inhale 5 times (you will see air bubbles coming from the coil). Priming purges air in the vaporisation system and therefore facilitates the entry of e-liquid to be vaporised. There is no need to prime after subsequent refilling. Your clearomiser is now ready for use. You can screw it to the battery and use it. How do you change the coil of your clearomiser? The metallic tube (or chimney) in the centre of the clearomiser conducts the vapour from the coil (where the e-liquid is vaporised) to the mouthpiece. Avoid all contact of the liquid with this tube when filling and changing the coil. When you unscrew the base to fill the clearomiser, make sure that you correctly put the washers back in place in order to avoid leaks. How to avoid a burnt taste? The burnt taste occurs when the coil is heated without a liquid. During a first use or when the coil is changed, make sure that it is well fed with e-liquid by priming the atomiser or by waiting several minutes before using your battery. Make sure not to use coils that are insufficient with regard to the voltage of your battery. With too much heat, the liquid will vaporise to quickly compared to the absorption capacity of the coil. Result: your coil will heat without liquid. How to avoid gurgling and leaks? This is a sign that the liquid has gotten into the central tube. This often happens after refilling. Clear the central tube from liquid to solve the problem. In order to do this without emptying the reservoir, disconnect the clearomiser from the battery, wrap the bottom of it in a cloth or rag and blow into the mouthpiece. If, after filling, the gurgling persists, the problem may be caused by a faulty or worn-out coil. Replacing it should solve the problem. The problem may also be caused by the way you vape. Unlike traditional cigarettes, inhalations with an electronic cigarette should be softer and longer, allowing time for the liquid to become completely vaporised. A strong and rapid inhalation can cause the non-vaporised liquid to enter the chimney giving rise to gurgling and liquid reaching the surface. When possible, keep the reservoir full and never let the level of liquid fall below 1/3. This helps maintain the "vacuum" in the reservoir and prevent leakage. When removing the base to refill your clearomiser with liquid, make sure to replace the washers to prevent leakage. The washers provide a good seal so be sure not to over-tighten the different parts.